When entertaining, I am a big believer in the practice of mise en place - preparing in advance all that withstands or even improves with being done ahead of time, thus freeing me up to focus properly on the tasks that must be performed to finish the dish in question come the actual dinner. In my case, because I know I'm incredibly slow, this planning process is absolutely critical if my guests are not to languish for too long between courses. Which is why I think of certain foods as food for two, and others as food for company. Soft, steamy, piping hot polenta only really acquires an exquisitely tender texture when slowly cooked to a cohesive mass over upwards of an hour, so I'd always thought of it as food for two until as of late, preferring to serve wedges of fried, griddled or roasted polenta (which, save the frying, griddling or roasting, can be prepared as early as the day before) when feeding a crowd. For I've since learnt from Judy Rodgers' The Zuni Cafe Cookbook that soft polenta actually holds very well in a covered double boiler set over gently simmering water for a few hours, which is incredibly convenient if you're planning to serve the polenta as part of a multi-course meal. In fact, the holding period (anywhere from 30 minutes to 3 hours) actually improves the stuff, giving the polenta meal time to swell and fluff even more. As much as I adore the soothing austere simplicity of polenta made with nothing but cornmeal, salt and water or stock, perhaps enriched with a little butter and parmesan at the end, I must say I am very partial to Venetian-style milk polenta (for anyone who's interested, Marcella Hazan gives a fabulous recipe for polenta alla Veneziana con il latte in Marcella Cucina). Typically rustic and hearty, here polenta takes on a delicacy and refinement of taste and texture by being cooked in a mixture of milk and water. It's enough to make an all-round polentoni - "polenta eater", as dwellers of the Italian south are fond of calling those in the north - out of the most stubborn; prior to tasting milk polenta, W would only ever eat the aforementioned fried, griddled or roasted firm variants. Polenta is often treated as a Cinderella food of sorts, never allowed to the ball in the best frock, typically served as nothing but a foil to some stew or braise, a medium for sopping up those savoury juices. Milk polenta, however, as much as it dutifully fulfils its role as carrier of meat jus, doesn't merely play second fiddle to any meat you may care to serve with it - however outstanding the meat, I daresay for once, the supporting starch is so moreish as to threaten to outshine (just, but not quite) the ostensible main dish. If I sound like I'm raving, than it's because I've yet to encounter an equal partnership where two halves made up such a greater whole. Flipping through my copy of Scott Conant's New Italian Cooking recently, I chanced upon his über-luxe take on milk polenta. In his Creamy Polenta recipe, cornmeal is cooked in a mixture of cream and milk. The rich dairy liquid medium, high ratio of liquid to meal (6 to 1, or 2 cups of cream plus 2 cups of milk to 2/3 cup of cornmeal), and slow patient cooking (1 hour and 45 minutes over the merest possible heat) ensure a luscious polenta with the velvety texture of custard that's truly unlike any other. And despite the extravagant use of cream and milk, it doesn't feel in the least bit heavy or stodgy. In fact, quite the opposite - if you can imagine ethereal being applied as a description of something with as sustaining an image as polenta, this is the candidate. So good it is made this way, I actually found it unnecessary to add the butter and parmesan at the end as specified in the recipe, which is unusual for me, because I am not one to hold back on the butter and parmesan. This was inspired by a lobster and black truffle risotto from Christian Delouvrier's Mastering Simplicity. 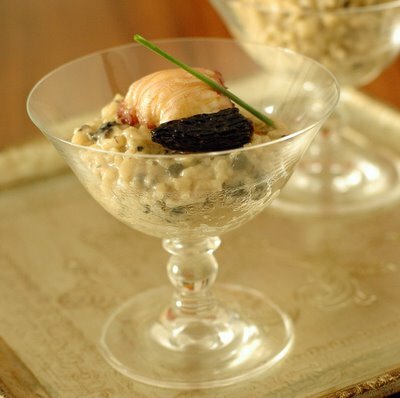 The arborio rice is cooked in lobster nage and finished with morel duxelles (which I made with dried morels, ceps and truffle oil) and chunks of butter-poached slipper lobster. The thyme and juniper berry-scented chestnut soup recipe comes from Tamasin's Kitchen Bible by Tamasin Day-Lewis. 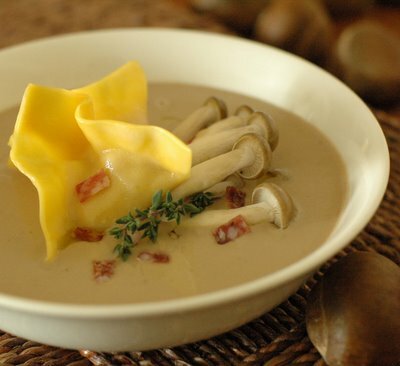 As I had used duck stock for the soup base, I thought some tortellini stuffed with shredded roast duck and a mousse of foie gras (I happened to have some pate de foie gras in my fridge which I put to this use) would make for a good garnish. A tartly refreshing breather between fairly rich courses. 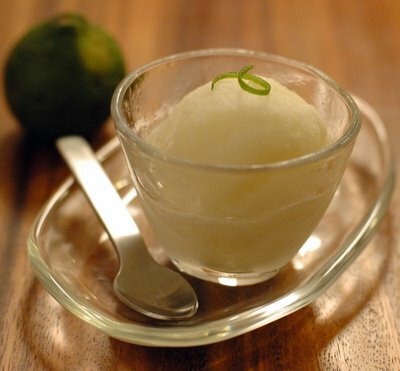 I used the smaller yellow-fleshed limes known as calamansi rather than the golf ball-sized key limes as I like the aromatic intensity of the former. The recipe, which incorporates egg white to stabilise the sorbet mixture, is adapted from Caroline Liddell and Robin Weir's wonderful book, Frozen Desserts. The oxtail daube is from Paula Wolfert's magnificent book, The Cooking of Southwest France. Although I already own a previous edition of this definitive culinary classic published by Grub Street in 1997 (which was first published in 1983), this 2005 edition is so extensively and completely updated it's, to me, practically an altogether new book - I had to have it, that much was clear. Meaty chunks of oxtail are braised in red wine and the other usual aromatic suspects in a closed pot with the heat controlled such that the liquid barely shudders, let alone come to a boil. A good 5 hours later, the meat emerges meltingly fall-apart, eat-with-a-spoon tender. Gelatine-rich salt pork and a pork trotter (which are fished out mid-way through cooking, processed to a paste, and smeared atop the oxtail pieces before proceeding with the rest of the cooking) are added to the cocotte - preferably enamelled cast iron - to surrender their sticky, lip-smacking quality to the sauce. From Thomas Keller's Bouchon, where M.Vrinat's Taillevent version is cited as the ultimate model Marquise. 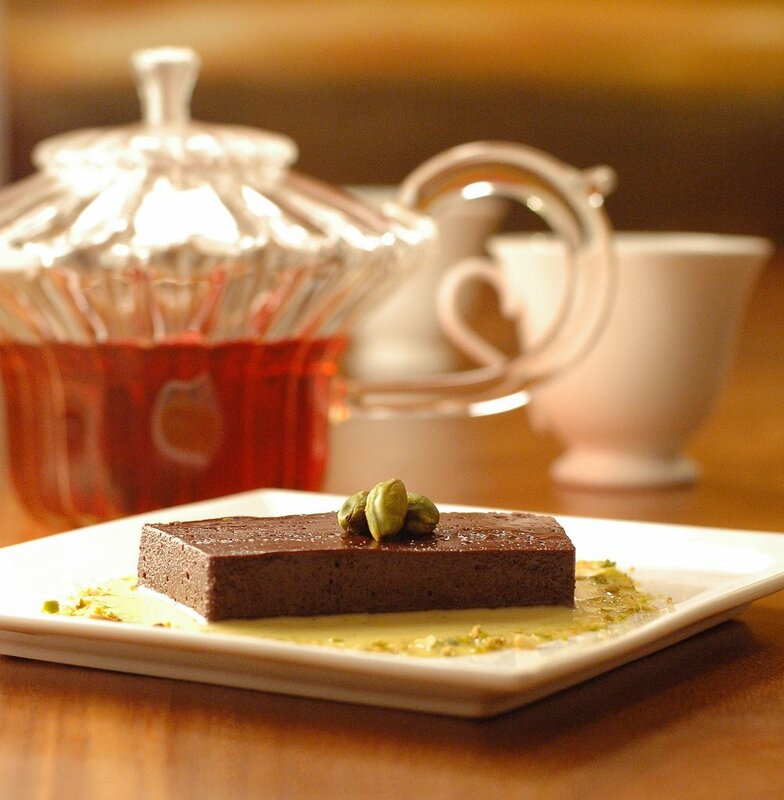 The mousse, which is so rich and thick it can be unmoulded and sliced, is served with a vanilla scented custard sauce and toasted pistachios. Jocelyn - it is all so wonderful, as usual. Your friends must eagerly await an invitation to dinner at your house! Did you have to make the risotto at the last minute or do you have a trick for holding that as well? Why when ever it comes to leaving acomment here am I always at a loss for words. So many thoughts and none seem right. Your friends are truely lucky indeed! everything looks simply amazing. kudos to you J! How I would love to enjoy a Valentine's Day meal as you've prepared. I had a marquise for dessert about a week ago but yours puts that one to shame. As always, youru photography is tremendous. I had no idea that polenta could be held like that, J, not to mention that I've never had polenta made with a dairy base before. It certainly sounds delicious. And, as always, the presentation is fantastic. say am jealous of your oxtail daube. why cant the Greeks love this part of the meat?? groan!! 5 hrs.. good but never I have done this with added trotter to get the gelatin. I go to the flea market every now and then and look for goblets. thanks for that take on polenta, always thought it to be fairly tasteless (I've probably tasted some really bad ones in the past) but you've certainly changed my mind enough for me to give it a try soon! J - what an awesome looking feast. Every time I visit, I think "this is it - I'm sure no one can top it"....then YOU go and top yourself!!! Thanks for sharing your thoughts, your meals and your photos. hi nic, thanks for your kind words! that double boiler trick is a pretty nifty one, i must say. the dairy based version is rather unusual, but i am so glad i gave it a go! Happy V-day, J! Oh my, what a feast. 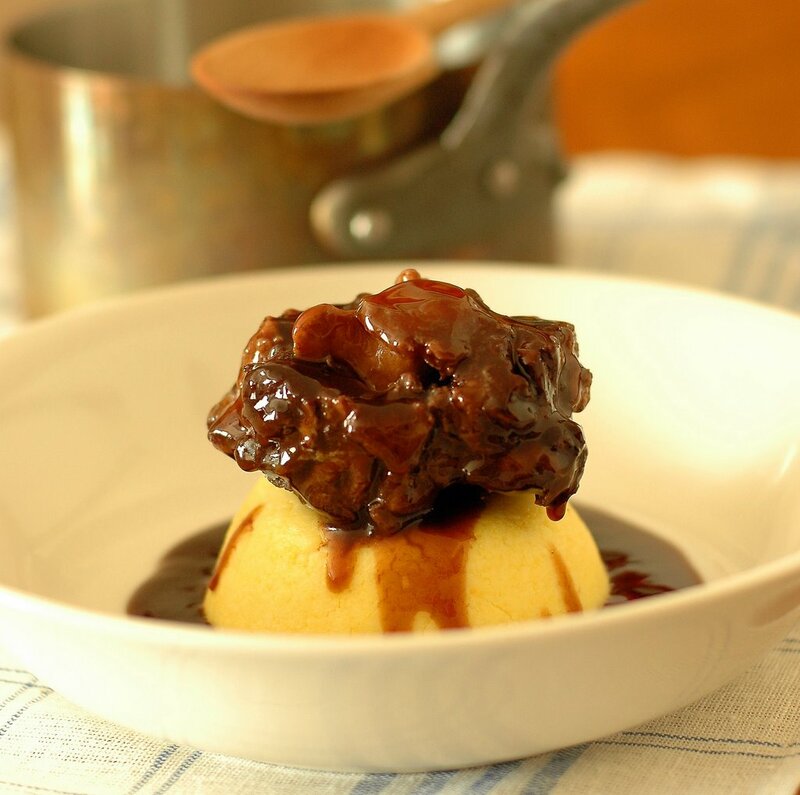 I've never been a fan of polenta and always omitted it from my oxtail recipes but this dairy-rich one looks worth trying! I might even become a convert. Also, I have never added pork trotters to my oxtails for the added gelatine ... what a brilliant idea! As usual, I learn so much from you. I second Keiko by saying I love the teapot. Gorgeous! I really think you should run classes in Singapore. Or publish a cookbook. Be our very own Nigella. If you are, I'll be one of your 1st devotees. Hi J - and continuing from MM, I'll be your second devotee! ...or I might have to fight her for first position! You truly are amazing. How many cookbooks do you own, my dear? Everytime I read about your gorgeous food and you list all these different cookbooks, and then I become not only jealous of your cooking, but your cookbook collection as well!! Gorgeous presentation, and you and W have a wonderful Valentine's Day! Hi Jocelyn - I must repeat Ruth - every new post is full of even more impressive dishes and pictures than the previous ones, although one wouldn't think it's possible! Hi J, I followed the link from Greedy Goose's blog and landed on yours! I must say I really enjoy your writing and I just read the first month's archive. My, you have a really nice collection of cookbooks there! Jennifer,the pictures on your blog are just outstanding - such attention to detail. I love your use of colour and textures in your photographs, all of which never overshadow the food. Cooking must be a real labour of love for you. Thanks for taking the time to share your passion with us - I'm looking forward to your future postings! Okay, you've sold me on both the milk polenta and the revised Cooking of Southwest France. Speaking of both, have you tried Wolfert's recipe for oven-baked polenta? I wonder if it would be successful with the milk/water or milk/cream combo. I may just have to try it and let you know! Your dishes are stunning, like always, J. And like everyone else, I love that teapot! Well, well Ms J., Nothing to add to the comments above really, except a big bravo! I recently discovered that adding mascarpone to a creamy polenta just makes this sometimes second cousin of the carb world that much more intersting. Plus a nice big handful of parmesan and plenty of black pepper. Just that and some nice sausages make a lovely (and rather caloric!) meal. I do admire how you manage to style everything so beautifully with guests around. They are a patient lot indeed (and oh so lucky!). Wow, J, the effort you put into your meals just leaves me in awe. I can only aspire to serving my guests such labour internsive meals one day. I'm looking forward to trying the polenta some time though. Thanks for the holding trick. Yay! Calamansi! we've got lots of it here in Manila! hi j, may i add you into my blog? Hi J., as always, everything looks incredibly delicious and your pictures are so vibrant! I'd love to try oxtail and polenta sometime - it seems like the perfect winter dish! Lovely work again. I was pleased to see Marcella Hazan popping up in there. I've got a cookbook of hers that dates back to 1980 and it's the first thing I go to when I'm cooking Italian. Agreed on mise en place. I don't know if I've especially improved as a cook as much as now knowing what to have ready and when to do it. It changes a dinner party from madness to a well organised campaign. This has meant though that I've acquired an unseemingly large number of stainless steel containers. hi cin, thanks! since learning the holding technique, i can't say i've ever cooked soft polenta as often! hi robs, thank you so much for your very kind words! hi putoseko, yay! here in singapore too! hi anthony, thanks for your kind words. marcella hazan rocks, in the best italian mama sort of way. glad to see i'm not the only control freak ;) i use disposable plastic containers which i buy in bulk, thus tossing them away as i go along and doing away with having to wash them up! Always deserving. I love the way Marcella can be completely dismissive of the infrerior in that lovely sad and disappointed motherly way. Cooking has always been the ultimate control freak hangout. Tsk chucking stuff away, beware the wrath of Hedora. Hmm I guess it depend what you put in it but I know pet bottles shouldn't be reused more than a couple of times. Just get a bunch of dariole moulds and small bain maire tins and it'll all be hunky dory. The added advantage is you can keep them warm in the oven.